Bethune-Cookman University head coach Brian Jenkins just concluded his second season at the helm of the Wildcat football program. The Wildcats followed up a remarkable 10-2 season in Jenkins’ first year with an 8-3 overall record and a 2nd place finish in the Mid-Eastern Athletic Conference. Through 23 games, Jenkins has won 18, compiling an impressive .783 winning percentage for the Daytona Beach, FL institution. While wins and losses are important to every coach, Jenkins’ real testament has been in the way his players have performed off the field. Since his arrival, graduation rates have improved and players have become a mainstay in the community, forging a strong relationship with the Daytona Beach, FL community and surrounding areas. On Thursday, HailWildcats.com contributor Bradford Gillens and I had the pleasure of speaking to Coach Jenkins via conference call on everything from his rating of the team’s performance this past season to his prediction of this year’s Liberty Bowl. (Jenkins is a 1993 graduate of U. of Cincinnati and the Bearcats take on Vanderbilt in this year’s game). Assess your team’s performance this season, what grade would you give and why? How about yourself; assess your own coaching performance. What grade would you give yourself and why. This season, the offense employed more of a “ground and pound” attack with your stable of runningbacks, which was a stark contrast to the vaunted Speedway offense we saw last year. Was that a philosophical change due to the departure of Danny Barrett and Mark Orlando and arrival of Rob Spence, or simply a result of you tailoring the offense to the strengths of your personnel? What happened with Jamarr Robinson? He began the season in impressive fashion against Prairie View, but by mid-season was relegated to the #3 QB on the roster? Why didn’t we see more of him the second half of the season? Ryan Davis was selected as the MEAC Defensive Player of the Year following a stellar senior season but was probably over shadowed this preseason by other Wildcats. What do you attribute to Davis having such a breakout year? Talk about the play of Ryan Lewis and Reggie Sandilands. What have they meant to this team since you’ve been here? There hasn’t been a MEAC team advance past the first round in an FCS Playoff game since 1999. Whereas you have an upstart program like Old Dominion who in 3 years has produced more playoff victories than every school in the MEAC except FAMU, SCSU and NC A&T. What are your thoughts on what the conference can do to improve their chances of victory in the postseason? Are you still upset about your team’s playoff snub? How well do you believe your team would have matched up against this year’s playoff participants? What are some of the immediate needs B-CU needs to address in order to get back to their championship form of 2010? Can you provide a general overview of your offseason calendar? When does spring football begin? Looks like your alma mater drew Vanderbilt in the Liberty Bowl. Do you still follow the Bearcats on a weekly basis, and if you do, what is your prediction of the game? Coach thank you for that long winded answer but you still never made a prediction. Who are you going with in the game Cincinnati or Vanderbilt? You created quite a buzz with those new helmets. Did you have any idea that the fans would react so favorably to the head gear? Who designed the helmets? You now have 75 uniform combinations. 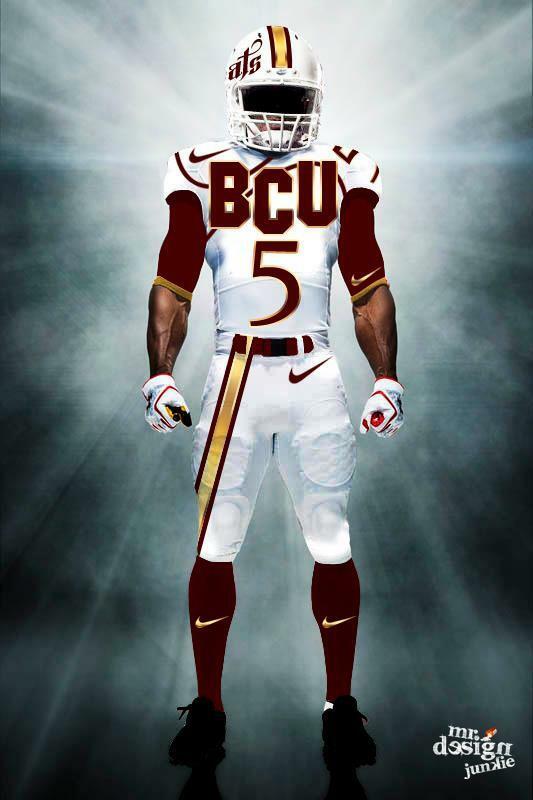 I’ve heard some call BCU the Oregon/Maryland of the HBCU world with all of the uniform combinations. Who will decide which uniforms will be worn in each game next season? Can we expect any new alterations to the uniforms and/or head gear next season? “I told my wife that these helmets might be my tombstone if they don’t go right. It kept the traditional colors, but brought some freshness and newness to the program…very happy it all worked out. And I tell you what; it kind of gave us some juice as a team. We brought out the first (maroon and gold) ones against Morgan St. (49-23) and we had a big win and the second set (black) we wore in the Florida Classic (26-16 over FAMU). How rewarding was it for you to win your first Blue Cross Blue Shield of Florida Classic this season? Coach we’re 13 days away from your two year anniversary as the head coach of Bethune-Cookman. What stands out as the thing you are most proud of accomplishing in that time period?